Residents of Los Angeles, this one's for you. On Tuesday, November 27th, an amazing event is taking place at The Peppermint Club in West Hollywood. 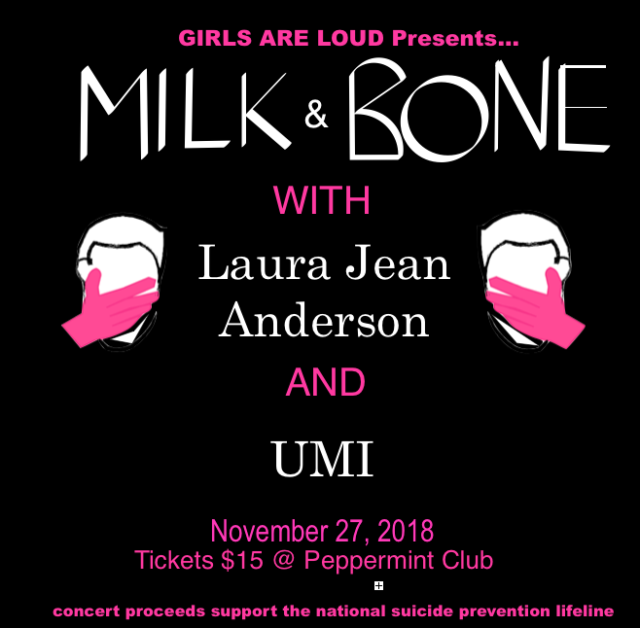 Brought to you buy the all-female musician collective, Girls are Loud, this show at The Peppermint Club features live music from Milk & Bone, Laura Jean Anderson, and UMI, with backing band support from the Girls Are Loud team. Not only will you receive a sonic gift from the gods form some of the best, rising musicians on the scene today with your attendance, but you will also be putting your money towards a good cause. Proceeds from Girls Are Loud’s first ever live event will go towards the National Suicide Prevention Lifeline. If you are reading from outside of the LA area and still want to help, please share this with your LA-based friends, they won’t want to miss this event. For all you avid EARMILK readers, you’re likely aware of UMI and her amazing talents. And while a $15 ticket is a steal to catch a glimpse of UMI’s live set, she’s not the only draw here. Both Laura Jean Anderson and Milk & Bone are incredible and deserve every second of your attention on the 27th. Not only will each artist play music from their stellar respective catalogs, but also they will play one song from an artist who has passed away this year. While this is their first event, it surely will not be the last live show put on by Girls are Loud. Be sure to check out all of the featured artists and keep up with Girls are Loud and all of their work below.